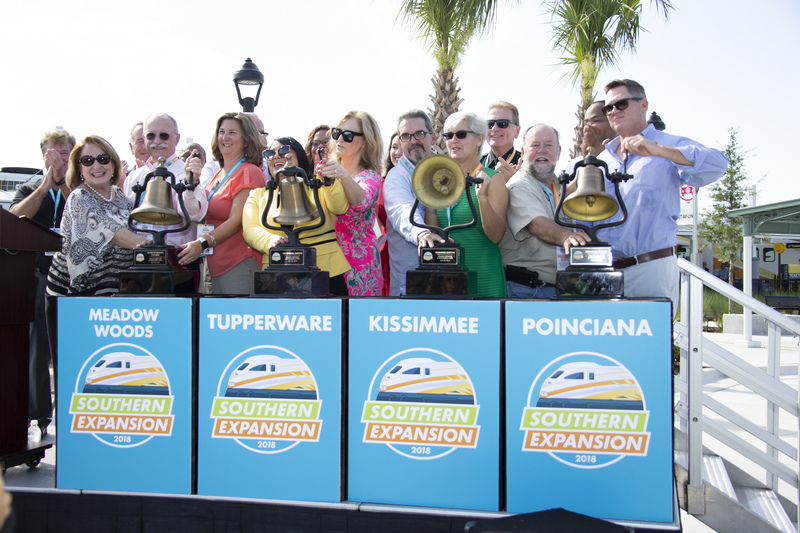 Orange County Mayor Teresa Jacobs joined community leaders and representatives from the Florida Department of Transportation (FDOT), Federal Transit Administration, and Tupperware Brands for SunRail’s Southern Expansion Inaugural Ride and the Grand Opening of Phase 2 on July 28, 2018. The ceremony commemorated the 17-mile expansion within Orange and Osceola counties and new stations located in Meadow Woods, downtown Kissimmee/Amtrak and Poinciana. The bell ringing ceremony, a partnership between federal, state and local government agencies, was held at the new Tupperware Station in Osceola County. The event began with a community celebration and remarks from community leaders at each of the four new stations. Passengers then boarded trains to conclude the morning at the Tupperware Station. While on the train, local residents were treated to an interactive ride and learned more about SunRail, rail safety, schedules and routes. SunRail began service in 2014 with Phase 1, operating a 32-mile daily service that stops at 12 stations, Monday through Friday, from DeBary in Volusia County to Sand Lake Road in Orange County. In additional to Phase 2 opening, the region will invest nearly $12 billion dollars over the next five years in Central Florida’s massive transportation system with improvements to I-4, expansion of the Orlando International Airport and the completion of Orlando’s beltway, the Wekiva Parkway. Through Orange County’s INVEST in Our Home for Life program, more than 200 miles of local roads will also be constructed, improved, widened or rebuilt.